I’m beginning to believe in a Europe-wide officiating conspiracy against Valencia. There’s no other way to explain the constant, laughably terrible calls which have gone against the side. Last night, in the 86th minute of a 0-0 match, Nikola Zigic was practically mugged in the penalty area. The foul was so blatant that his shirt was even ripped open. But the ref didn’t see a thing! None of his assistants did either! It’s was the most ridiculous non-call I’ve ever seen, and the players went rightly nuts. Valencia’s coach, Unai Emery, lost his mind and was booted from the game because of his vociferous protestations. The game ended 0-0, and Valencia was eliminated from the Europa League. What the hell?! How does a referee capable of making such terrible calls end up in charge of Europa League games? This guy, Florian Meyer from Germany, should be fired. I’m looking for video of the incident, but haven’t found anything embeddable yet… leave a comment if you’ve found one. 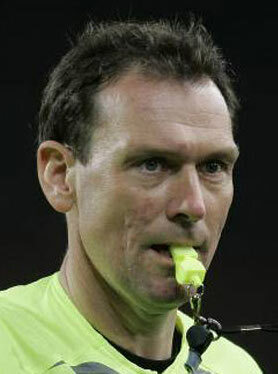 How about you actually use that whistle, jerk? As a Liverpool fan, who used your blog a lot for information on the Fallas festival just passed, I was very disappointed not to have a chance to meet Valencia in the semis! We shall enjoy Hamburg, hopefully!